One of the HTR's has been tucked away in the bushes for some weeks now. He or she appears every now and then, but skulks around in the shrubs for most of the time while undergoing the annual moult. I finally managed to lure it out today and got a couple of pics of the emerging feathers. Will be extra beautiful again when new feathers are completely through but still lovely as is! That strange looking in-between time of moult when new feathers aren't quite complete and tail somewhat short at the moment lol but good to see one of the HTRs back; nice photos Paul. Good to see the little guy getting some of his new plumage. Still a little way to go before he's completely bushy tailed but he's bright-eyed. You're going to have to give them their own name tags so you can tell them apart more easily! 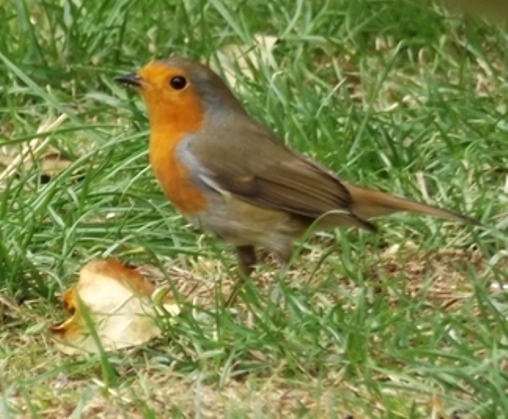 Once the moult is complete I should know the identity of this Robin. In addition, Mrs HTR doesn't sing, so that would be a good indicator. 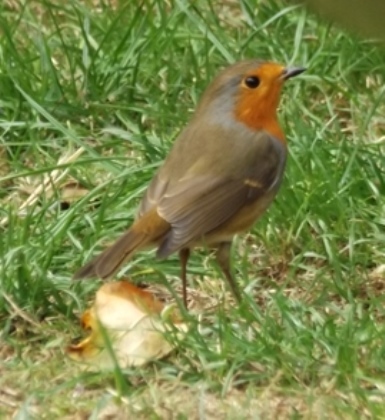 I don't expect any singing until the moult is done, but there has been a lot of ditting with a neighbouring Robin. Nice photo MC and yes, a lot of the birds are in full moult at the moment. It seems to be a good year for Robins - in my garden anyway. I have at least six different Robins hopping around mostly juveniles in various plumages! Some with completely juvenile plumage and some with the red breast now coming through. I suppose in time some of them at least will be forced elsewhere. Lucky you Sandra having a smart looking Robin, mine has gone awol again!